Welcome to the ancient Pieve San Felice in Pincis. The church's history begins in the Etruscan era, runs through the Papacy, is fought over by the municipalities of Florence and Siena, and sees frequent changes of hands between local families. The last of these were the Grisaldi Del Taja, who were among the founders of the Consorzio del Chianti Classico in the first half of the 20th century. The early 1970s mark the beginning of a new development model: the estate was bought by the Allianz Group, which set its sights on enological and territorial excellence. The village was fully and painstakingly restored, through a series of works that accentuated its characteristic art and architecture. An extensive programme of vine replantation was launched with a view to bringing out the best in the predominant Sangiovese. The project was complemented by a scientific study of indigenous vines, in partnership with the universities of Florence and Pisa. 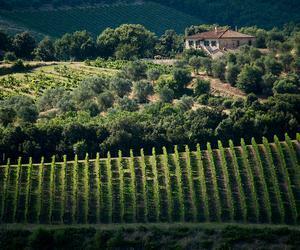 In 1982, the Group also purchased the Campogiovanni estate, comprising 20 hectares of vineyard on the slopes of Montalcino, another territory associated with the highest tradition of viticulture and winemaking. Today, the Borgo and Agricola San Felice are two successful organisations with a single heart, which combines tradition and innovation. James Suckling 96 "Perfect aromas to this red with licorice, stone, peach pit, plum, leather, and iron. Full body, fine and silky tannins support a deep and rich fruit concentration that shows black fruit, Tuscan dust and oyster shell. Needs four or five years to soften but an amazing finish." Wine Enthusiast 90"Perfect for pairing with grilled meat, white beans or hearty pasta dishes, this bright Rosso di Montalcino opens with notes of plush cherry, with almond, spice, leather and tobacco. The mouthfeel is characterized by toasted oak notes and bright acidity."